A review of the evidence of the reliability and validity of Dartfish's video-based movement analyses. Lu Z, MacDermid J. 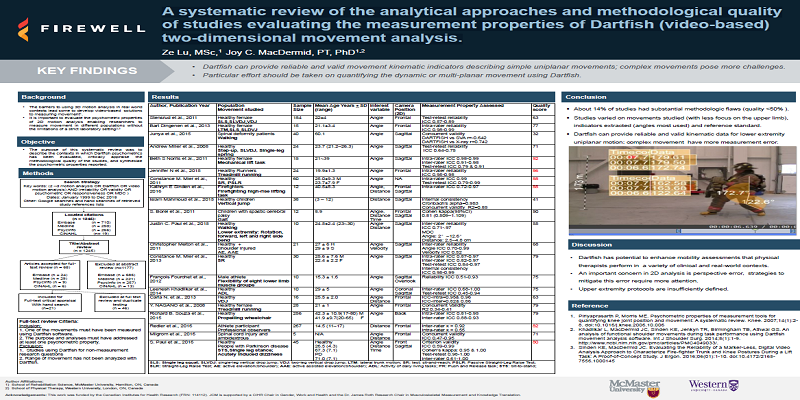 A systematic review of the analytical approaches and methodological quality of studies evaluating the measurement properties of Dartfish (video-based) two-dimensional movement analysis [poster]. McMaster University Rehabilitation Science Graduate Programs Open House. Hamilton, Ontario. January 23, 2019.